Circular dichroism (CD) spectrometer is an analytical instrument used to study the molecular structure and chiral activities of biomolecules. The global circular dichroism spectrometers market was valued at approximately US$ 28.0 Mn in 2016 and is anticipated to register a CAGR of more than 6.0% from 2017 to 2025 to reach approximately US$ 51.0 Mn by 2025. Newer modalities of CD spectroscopy, such as fluorescence detection CD and stopped flow CD, are projected to spur the adoption of CD spectrometers in the near future. Circular dichroism spectrometers are widely used to study biomolecules such as proteins, DNA, and their conjugates to understand their secondary structure, chiral nature, and the impact of various factors such as temperature, pH, and solvent on its chiral nature. As the pharmaceutical and biopharmaceutical companies are shifting their focus from chemical formulations to biological drugs, demand for CD spectrometers is expected to go up. Newly introduced CD modalities, such as FDCD, stopped flow, vibrational CD, etc. are expanding the application areas of CD spectrometers, which is anticipated to augment their adoption in the near future. Researchers from public and private sector are taking initiatives to build reference data for circular dichroism of various biomolecules which is expected to attract new researchers to adopt CD spectroscopy as a preferred analytical tool. DichroWeb and Protein Circular Dichroism Data Bank (PCDDB) are the two major reference data sources for circular dichroism. CD spectrometer is an expensive capital equipment which requires specialized infrastructure and skilled operators. These factors compel potential customers to rely on outsourcing their research activities. Besides this, over-reliance on alternative analytical tools such as Raman spectroscopy, nuclear magnetic resonance (NMR) spectroscopy, and X-ray crystallography is another concern area which restricts the CD spectrometers market. Earlier, circular dichroism spectrometers had limited applications which had restricted their adoption to government institutes and research organizations in the developed markets. However, key players and researchers have developed new modalities of CD spectrometers to expand their applications and user base. There is a huge unmet need in terms of affordability and end-user training. Companies can leverage their infrastructure and expertise to make affordable CD spectrometers and spread awareness regarding the product through training programs. There has been a trend of exploring new modalities for CD spectroscopy among researchers. The market players are introducing new add-on accessories and integrated systems to address this demand. For instance, circularly polarized luminescence (CPL) spectroscopy, which is an extended analog of CD spectrometry, had been limited to a few research centers, where researchers used to assemble the system using combination of photoelastic modulators, linear polarizers, and photomultiplier tubes. Jasco has developed a CPL system which can be used in combination with its existing J-1500 and J-1700 CD spectrometers. The global circular dichroism (CD) spectrometers market can be segmented on the basis of product, end-user, and geography. Among products, the circularly polarized light sources segment, followed by multiple light sources segment, is projected to lead the market and to continue its dominance during the forecast period. Multiple light sources CD spectrometers offer ease of switching between spectral wavelengths, study criteria, and study type at shorter time. Among end-users, government & private research organizations was the leading revenue generating segment in 2016 and is expected to continue its dominance during the forecast period. As pharmaceutical companies are increasing their expenditure on research and development, the shift from pharmaceutical formulations to biological drugs is expected to fuel the uptake of CD spectrometers in the pharmaceutical industry. Geographically, North America constituted the lion’s share of the global circular dichroism (CD) spectrometers market in 2016. High funding for research organizations and academic research programs and adoption of technically advanced analytical tools in the U.S. have contributed toward the leading share of the market in North America. Asia Pacific is projected to gain significant market share during the forecast period and become the key revenue generator in the next few years. Initiatives taken by local governments to develop academic infrastructure and shifting of R&D activities to Asia Pacific by international pharmaceutical companies are estimated to fuel this expansion. Key companies operating in the global circular dichroism (CD) spectrometers market and profiled in the report include Jasco, Applied Photophysics Ltd., Bio-Logic Science Instrument, Inc., On-Line Instrument Systems, Inc. (Olis), and Bruker. These players are adopting organic and in-organic growth strategies to expand their product offerings, strengthen their geographical reach, increase their customer base, and garner higher market share. For instance, Hinds Instruments has licensed its microplate CD reader to Bio-Logic Science Instrument for distribution across the globe. Applied Photophysics has launched a new version of its Chirascan CD spectrometer, Chirascan Q100. Circular dichroism (CD) spectrometer is an analytical instrument used to analyze the molecular structure and chiral activity of organic molecules. It is widely used in the study of biomolecules such as proteins, DNA, DNA peptide conjugates, etc. Organic molecules depict different tendency toward absorption of right-handed and left-handed polarized light, based on their molecular structure such as β sheet and α helix in proteins. Researchers and industry players have developed new modalities of CD spectrometers such as fluorescence detection CD, stopped-flow CD, vibrational CD, and circularly polarized luminescence which can assist in analyzing ground state and photon excited state molecular structure and chiral activities of an organic molecule. These modalities have expanded the application of CD spectrometers in R&D processes in the biopharmaceutical industry. This report on global circular dichroism (CD) spectrometers market comprises an elaborate executive summary, which includes a market snapshot with information about various segments of the market. It also provides information and data analysis of the global market with respect to the segments based on product, end-user, and geography. A detailed qualitative analysis of drivers and restraints of the market and opportunities has been provided in the market overview section. The report provides key insights of the global CD spectrometers market comprising global import-export scenario, pricing analysis by product & region, technical advancements, key vendor and distributor analysis, Porter’s five forces analysis, and market risk assessment. In addition, the competition landscape section comprises competitive matrix, key players market footprint, key competitive business strategies, and company profiles with business overview to understand the competitive landscape of the market. The report also provides market attractiveness analysis by geography and market share analysis by key players, thus presenting a thorough analysis of the overall competitive scenario in the global circular dichroism (CD) spectrometers market. Based on product, the global circular dichroism (CD) spectrometers market can be segmented into linearly polarized light sources, circularly polarized light sources, and multiple light sources. The report also offers global overview of the CD spectrometers market, based on the wavelength, into UV-Vis CD spectrometers and IR CD spectrometers. The product segments have been analyzed based on commercially available CD spectrometers product type, application area, adoption of each product type, and presence of key players in the region. The market size and forecast for each of the segments have been provided for the period from 2015 to 2025, along with their respective CAGR for the forecast period from 2017 to 2025, considering 2016 as the base year. 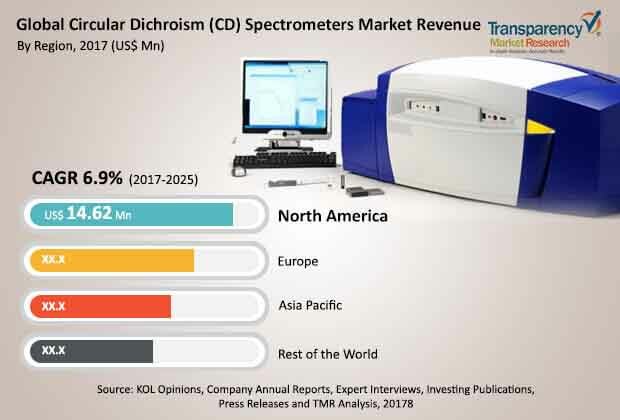 According to end-user, the global circular dichroism (CD) spectrometers market can be divided into pharmaceutical industry, government & private research organizations, and contract research organizations. The market size and forecast for each of these segments have been provided for the period from 2015 to 2025, along with their respective CAGR for the forecast period from 2017 to 2025, considering 2016 as the base year. Geographically, the global circular dichroism (CD) spectrometers market can be categorized into four major regions and key countries in the respective region: North America (the U.S. and Canada), Europe (the U.K., Germany, France, Italy, Spain, and Rest of Europe), Asia Pacific (China, Japan, India, Australia & New Zealand, and Rest of Asia Pacific), and Rest of the World. The market size and forecast for each of these regions and the mentioned countries have been provided for the period from 2015 to 2025, along with their respective CAGR for the forecast period from 2017 to 2025, considering 2016 as the base year. The research study also covers the competitive scenario in these regions. The report also profiles the major players in the market and provides various attributes such as company overview, financial overview, product portfolio, business strategies, and recent developments. Major companies profiled in the circular dichroism (CD) spectrometers market are Jasco, Applied Photophysics Ltd., Bio-Logic Science Instrument, Inc., On-Line Instrument Systems, Inc. (Olis), and Bruker.